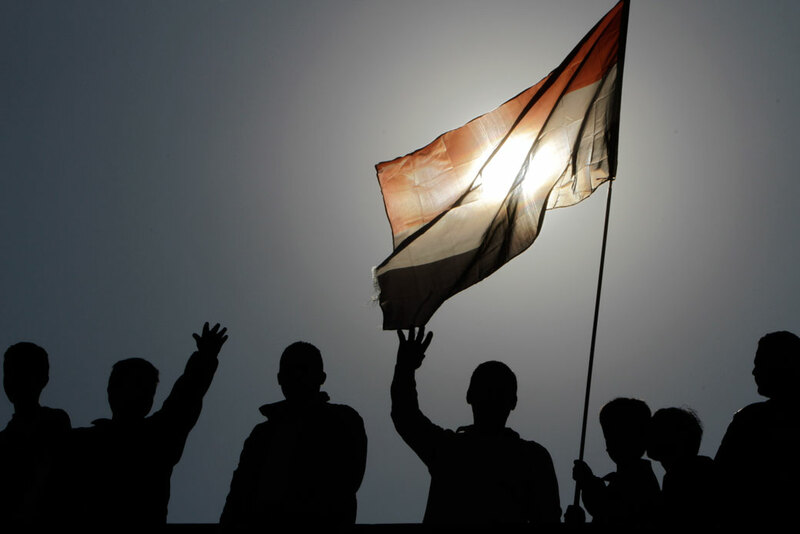 Egyptians wave a flag, December 2011. Trump seeks warmer ties with Sisi, but the U.S. must ask for better in return for the sake of both countries. The goal can’t be warm relations between leaders—it must be improved cooperation. U.S. terrorist designations should be based on sound intelligence—not ideology. Relations between Washington and Cairo may be poised to grow warmer after years of drift and turbulence, but the Trump administration should engage Egypt with a sharp focus on how Egypt can benefit America’s interests and advance the values needed to defeat extremism. Donald Trump’s first meeting as president of the United States with Egyptian President Abdel-Fattah Al Sisi offers a significant opportunity but also some risks for U.S. security interests and values. U.S.-Egypt ties have witnessed historic strains in the past few years at a time when the broader Middle East slipped into a state of violent fragmentation that threatens both U.S. interests and the global order. The region faces the confluence of global terrorist networks based within its territories; civil wars, state collapse, and mass migration; proxy battles between regional and global powers; and tensions between authoritarian states and young populations facing high unemployment. Egypt currently appears tenuously positioned to avoid the worst fates of its neighbors. However, Cairo’s new political and economic order remains inchoate and brittle, lacking a concrete plan for defeating terror networks, advancing large-scale job creation, or offering more effective or representative governance. Instead, the country’s civic space has been smothered to deny openings for the open exchange of ideas needed to defeat extremism, while Egypt’s economy goes from crisis to crisis. Regionally, Egypt has charted an independent course, but its influence in lessening regional tensions beyond its borders will depend on its recovery within them. Egypt’s leaders promise national renewal. However, absent significant reforms and credible plans to see them through, the Middle East’s most populous nation risks sliding back into stagnation and repression that heighten the chances that its simmering political, economic, security, and societal challenges will once again boil over. Under President Trump, there is also a new risk that cooperation between governments in Cairo and Washington deepens in ways that actually leave both countries worse off, mutually reinforcing their governments’ most repressive tendencies, leaving the relationship—and Egypt itself—on shakier foundations for the long term. Egypt has an opportunity to take proactive steps to address each of these challenges, and the United States can play a meaningful role in helping Egypt succeed—to the benefit of U.S. national interests and the Egyptian people. But this will only happen if both nations demonstrate the vision and political will to make it so. Renewed U.S. outreach toward a Cairo government hungry for international recognition could create new leverage and a fresh hearing for the United States with Egypt’s leaders and many of its people. However, warmer relations are not an end in themselves. What matters most is what they achieve for the interests of both countries and their people. It would be a dangerous outcome for both sides if closer ties between President Trump’s Washington and President Abdel-Fattah Al Sisi’s Cairo simply means abetting each other’s worst impulses, turning a blind eye to Egyptian domestic crackdown in exchange for an Arab leader vouching for President Trump’s most misguided policies. For decades, Trump has spoken of the need to demand more from U.S. partners around the world and his refusal to be beholden to outdated arrangements. Egypt should not be exempt from this Trump template. President Sisi has also said that he is not beholden to the old ways of doing business. Seek improved ties, but ask for better from Egypt in return. The incoming team should approach Egypt with a well-defined set of requests, including—as enumerated below—a public message from President Sisi to Egyptians that the United States is a partner and not a threat, actively facilitating U.S. economic and military cooperation, opening space for civil society and addressing outstanding cases involving U.S. citizens, and protecting religious minorities. The prospect of an eventual White House visit for President Sisi should be held as an incentive for progress on these issues. Continue to raise the issues of governance, preservation of open civic space, and government practices toward citizens. For the United States, one reason that Egypt’s repression represents a strategic liability is because it undermines long-term efforts to defeat violent extremists in the battle of ideas. For reasons both moral and strategic, the new U.S. presidential administration should expend some of its political capital with Cairo by encouraging tangible progress on opening Egypt’s forcibly narrowed public sphere and implementing good governance reforms and continuing to raise, publicly and privately, issues regarding the rights of Egyptian citizens. Congress should ensure that these issues remain on the bilateral agenda. Abandoning them is shortsighted. Focus security cooperation on the four pillars, plus training. Efforts to refocus military-to-military cooperation and assistance around four pillars, or priority areas—counterterrorism, the Sinai, border security, and maritime security—should continue. A fifth pillar should be training for Egyptian security personnel. Encourage Egypt to craft an integrated, broad-based strategy to counter violent extremism that enhances respect for basic rights of all. President Sisi has made advancing a more tolerant version of Islam a rhetorical centerpiece of his approach to countering extremist ideology. The United States should prioritize encouraging Egypt to implement a national strategy for countering violent extremism that includes outreach to at-risk youth and communities with tailored economic programs and community-police partnerships. U.S. government and technology companies can help Egypt ensure its religious authorities’ anti-extremism messages reach more people, faster, and in simpler language to have a global impact. Help Egypt meet security threats—but not with overly broad, politicized U.S. terrorism designations. The new Trump administration should seek effective security and intelligence cooperation with Egypt, consistent with the rule of law, to help it confront the threat of violent Islamists. However, although the Egyptian MB opposes the current Egyptian government and many of its leaders hold extreme views worth pushing back against, that alone does not qualify the organization for legal designation as terrorists by the United States—nor does it justify brutality in response. U.S. terrorism designations should be reserved for violence, not ideology; for actors directly engaged in violence that threatens U.S. interests; made consistent with legal standards for past designations; and based on rigorous, professional, and independent intelligence assessments—not punditry, bigotry, ideology, or political interference or opportunism. The fundamentalist ideas of some nonviolent Islamists are best countered through civil society and through offering more compelling alternatives in the marketplace of ideas. Even if current U.S. and Egyptian leaders agree on the risk posed by the MB, that must not negate the concerns over Cairo’s human rights abuses and the counterproductive nature of some of its security measures in confronting Islamist opponents. In researching this report, the authors conducted exhaustive field interviews in Egypt from May through July 2016 with President Sisi, top security and economic officials, parliamentarians, business leaders, cultural commentators, and other Egyptian and U.S. experts. On both sides, significant questions were raised about the future of the bilateral relationship. Egypt faces serious security threats that endanger its economy and stability. The downing of a Russian airliner over Sinai in October 2015 showed how vulnerable the country’s economy remains to terrorism.12 A heinous attack on a Coptic church in Cairo in December 2016 killed 28 people and wounded many more.13 Still, despite some high-profile attacks and regular low-level attacks in the Sinai Peninsula, Egypt’s terror problem has failed to metastasize in ways seen regionally—in itself a measure of relative success. The aftermath of the 2011 Libya intervention continues to reverberate in Egypt and across the region. Several Egyptian officials raised Libya and its long and porous border as Egypt’s paramount security challenge. Egyptians are concerned about IS, weapons smuggling via land and sea, MB networks, and the risk of Libya-based extremists infiltrating Bedouin communities in Egypt’s western desert. Egypt has also supported Libya’s General Khalifa Haftar, military leader of anti-Islamist east Libyan forces, despite international concerns that Haftar stands in the way of a united Libya.15 Egypt sees Haftar as a necessary bulwark against the Libyan MB and other groups on Egypt’s border. The security threats in Egypt’s Sinai Peninsula are a challenge not only for Egypt but also for broader regional security, as the networks of terrorist groups in the Sinai have an effect on events next door in the Gaza Strip and Israel. Egyptian officials claim significant progress in fighting militants since extremists attempted to take over the city of Sheikh Zuwaid in July 2015.16 Today, security officials underscore that local ISIS-affiliated militants cannot capture or hold even a single town. They also claim that the conflict area is contained to a corner of northeastern Sinai.17 Still, the terrorist threat in the Sinai is far from gone, with militants showing their ability to strike from east of the Suez Canal to the Israeli border. Indeed, the first quarter of 2016 was the deadliest for Egypt’s security forces in the past two years.18 And although there are sometimes lulls in attacks after major military operations, militants have continued to attack checkpoints, assassinate security servicemen, and kill locals accused of working for the government. Within the Egyptian military, there is a debate between those favoring more conventional security tactics and those seeking a more surgical application of force as part of a holistic counterinsurgency strategy.19 This second group of security officials speak of launching a new phase in Egypt’s Sinai operation focused on economic development plans to build mosques, medical centers, schools, and other infrastructure projects in northeast Sinai. Saudi Arabia has also pledged a $1.5 billion loan to develop the Sinai, and Egyptian officials hope to link ambitious plans for the east bank of the Suez Canal with development in the rest of the peninsula.20 Despite difficulties to date, the United States should continue to seek opportunities to encourage and assist in economic development in the Sinai. Differing threat perceptions regarding the Egyptian Muslim Brotherhood were a contentious issue in U.S.-Egypt relations during the Obama administration. From 2012 to 2013, Egypt was led by a president from the MB and a national parliament dominated by the MB that was elected by the Egyptian people in free and competitive elections. That government was ousted by the military in July 2013. Since 2013, Egypt has suffered from a wave of violence by armed groups and individuals believed by Egypt’s government to have ties to or be taking inspiration from the MB. This violence ranges from sabotage of critical infrastructure to assassinations of security officers.21 Following former President Morsi’s ouster and the violent clearing of MB protest camps and anti-government violence by Islamists, the Egyptian government designated the entire MB as a terrorist organization, arresting many of its leaders and seizing its assets.22 Groups and political parties such as the al-Wasat Party and the Islamic Group that initially aligned with the MB but revised their positions have been allowed to operate within certain boundaries. In large measure, this post-2013 wave of violence against the Egyptian state has been checked. The key issue for U.S. policy toward Egypt, however, is how both countries can most effectively combat terrorism and extremism in ways that produce real and enduring results. Even if Cairo’s approach can be said to have successfully tamped down violence, it remains unsustainable if the threat escalates. The Obama administration’s concerns with Egypt’s post-2013 crackdown on the MB stemmed not from favoritism or lack of understanding of the threat the MB poses to Egypt’s government but from lessons on how governments can most effectively treat political opponents, defeat terrorism, and prevent radicalization. Egypt’s large-scale arrest of thousands of suspected MB operatives and others could have dangerous long-term results as prison conditions risk radicalization. A heavy-handed approach also risks alienating communities into becoming safe havens for militant extremists. So far, most would-be terrorists in mainland Egypt have been rank amateurs. A dragnet policy of arrest and brutal tactics may yield short-term results while doing longer-term damage. Still, more targeted approaches will be needed to counter better-trained terrorists with a higher degree of operational security, such as ISIS. The Egyptian government should develop a credible plan that offers off-ramps for MB members and other anti-government Islamists. The Egyptian government has called on MB members to either abandon their group or cease demanding the overthrow of the government. As the government continues to succeed in weakening the organization, it will be necessary to create pathways for these individuals to re-engage in society and politics. Already the government pragmatically allows Islamists who accept the status quo, such as the Salafist Nour Party, to operate and win seats in Parliament.28 This has arguably helped prevent the party’s rank and file from joining terrorist groups in large numbers. Yet this does not mean that Sisi secretly supports Salafists. Egypt’s government should recognize that the same is true for other countries in the region, such as Jordan and Morocco, that allow the participation of Islamists. It was also true of the U.S. government during the Obama and previous administrations, which was not endorsing Islamists when it advised Cairo to allow a degree of pragmatic political participation of Islamist elements who abandon violence or do not challenge the government’s legitimacy. Doing so now could arguably weaken the MB’s appeal by giving its members an alternate path. Furthermore, allowing secularists, intellectuals, and progressive Muslim scholars the necessary political and civic space could counterbalance the voices of political Islam and fundamentalism in society, as to not repeat the mistakes of the Sadat and Mubarak regimes whose policies inadvertently facilitated the growth of these factions in Egypt. Despite policy disagreements, military-to-military cooperation shows some signs of improvement, particularly in the area of countering roadside bombs. Given Egyptian challenges and hard-won U.S. expertise in Iraq and Afghanistan, this should be an area of growth in security cooperation. But American military trainers and operators stress that technology offers no so-called magic bullet. Assistance to Egypt must be accompanied by both better access to U.S. personnel and transparency regarding the nature of the threat of roadside bombs in the Sinai and advanced training for Egyptian forces tasked with addressing it. U.S. military officials also hope Cairo heeds advice regarding the need for a new, more comprehensive program for Egyptian troops to more effectively use American equipment and counter terrorists in the Sinai.29 Future requests for advanced equipment or Excess Defense Articles for Sinai should be predicated on Egypt showing progress in these areas. The capacity of Egypt’s security forces also remains an issue, from airport security to operations in the Sinai to policing by the Ministry of Interior. In addition, Egyptian authorities continue to be wary of implementing law and order in places such as Upper Egypt where sectarian violence is often followed by so-called reconciliation sessions, which give legal impunity to attackers of religious minorities instead of prosecution and prison terms, in a bid to appease often-armed rural citizens.30 If properly designed and executed, a more robust liaison relationship between the FBI and Egypt’s National Security Agency—Cairo’s key agency tasked with fighting domestic terrorism—could have an effect on its professionalism and institutional culture, leading it to rely less on coercive methods and more on sound interrogation methods and technology. A more robust relationship between the CIA and Egyptian General Intelligence could also help both countries address threats and transfer expertise—but this must be navigated in a way that ensures a sharp focus on terrorist threats consistent with the rule of law and protections for basic rights and not broader campaigns to close off civic space. While the Sisi government has shattered Egypt’s Muslim Brotherhood beyond coherence or recognition,34 government leaders perceive themselves as still engaged in a kill-or-be-killed struggle against the Islamists they helped depose—a campaign that has affected Egyptians who are not Islamists as well. This fight not only represents the Sisi government’s rationale for ruling, it extends into every aspect of governance, from the treatment of civil society to economic reforms. The fear is that anything other than tight state control creates opportunities for Islamists to exploit. Having come this far, the key question for Egypt is how this threat perception evolves. Can Egypt find the self-confidence to move beyond such a stifling paradigm or will these constraints calcify into brittle politics that leave Egypt permanently on its back foot, vulnerable to each new shock, and without the resilience that broad-based governance offers or the pathways to employment or civic participation that give young people alternatives to violence and protest? Speaking to the authors, President Sisi was bracingly frank about Egypt’s social and political troubles. Since the late 1960s, Sisi said, “The Egyptian state has deteriorated in all areas.” His goal for his first four-year term, he declared, is to “prevent the state from collapsing” as it almost did five years ago. Sisi argued for patience with Egypt, pointing to South Korea as a successful example of modernization and democratization by an American ally with American support. “It took 20 years,” he asserted, “but America’s priority was for South Korea to succeed, so [America] looked the other way on abuses.”37 Sisi’s concerns about the depth of Egypt’s challenges should be taken seriously, but so should the efforts that South Korea and others underwent to become an economic powerhouse and functioning democracy. Nonetheless, parliament has in recent months passed several significant laws, including a revised civil service law and a value-added tax. Unfortunately, it has also advanced a nongovernmental organization law that would criminalize civil society cooperation with foreign organizations without a permit and ban NGOs from engaging in politics, with penalties including imprisonment.43 Such legislation and the repression it would enable risk smothering any attempt to forge a contest of ideas that grows beyond identity politics and patronage. The need for effective service delivery and governance at every level is palpable in Cairo. After 2011, for instance, a so-called construction revolution of unregulated building unfolded, including makeshift on-ramps to elevated highways and piping grafted onto existing sewage systems.44 Government spending on local urban needs remains highly centralized at the Ministry of Planning, and the failure to reconstitute local councils after 2011 has left parliamentarians to pick up the slack. As one member of parliament noted, “There are more people in my district than citizens of Qatar” without a local administrator. Parliamentary passage of a local election law is a vital first step to filling this void. U.S. policy over the past several years has also sought to call attention to the status of both women and religious minorities inside Egypt,45 the latter of which President Sisi has championed.46 The recent deadly bombing of a Coptic church in Cairo makes clear the ongoing challenge of sectarian violence.47 A new U.S. administration and Congress should continue to engage with Egypt’s government and society to make clear that both remain a part of the bilateral discussion and that more can be done, including ending the practice of so-called reconciliation sessions that give legal impunity to attackers of religious minorities. In recent years, Egypt’s economy has been buffeted by declining tourism, a currency crisis, and surging prices for basic goods—all atop decades of mismanagement and failed development, a legacy recognized by many of the Egyptian leaders the authors interviewed, including President Sisi. Egypt’s budget deficit stands at 12 percent of gross domestic product, and its youth unemployment rate stands at 40 percent.48 At more than 7 million people, Egypt’s government employment rolls are several times what is required to run the country. There is little evidence that Egypt’s glossy “Vision 2030” report detailing its development strategy is guiding Egyptian government policy.57 As one Egyptian businessman said, “There is no longer a framework, it is all piecemeal, depending on the will of the president . . . Egypt is scrambling for quick fixes, done on the [military] fast track, but it’s a fine line . . . They will never let this place become Dubai, and their word is final.” Indeed, the state’s role in the economy appears to be growing.58 Absent policy reforms and the rule of law—the software to go along with Egypt’s ambitious upgrades to its infrastructural hardware—it is doubtful that Egypt’s focus on military-driven megaprojects will yield the desired results. For a variety of reasons, the United States has struggled to implement economic assistance in areas as diverse as technical assistance to the Central Bank, scholarship funds, and governmental decentralization.59 So great was the backlog that the United States redirected more than $100 million in aid destined for Egypt to other priorities.60 However, where Egypt is ready to accept U.S. advice and assistance, the United States has tools—including technical assistance, business-to-business ties, and the Egyptian-American Enterprise Fund—that can help Egypt attract investment and create jobs for its people. The fact that the Egyptian state cannot cover its own costs, fiscally or militarily, is an enduring headache that has bedeviled Egypt’s leaders and shaped its foreign policy for decades. That is why, despite their current difficulties, Cairo’s relations with the Gulf countries have been perhaps Egypt’s most important.64 Since 2013, Arab Gulf states have collectively spent more than $30 billion to shore up Egypt.65 However, a sense of dependency and moral hazard have crept in, creating mutual resentment. The United Arab Emirates assigned a minister of state and a large team to Cairo and helped design a reform plan for Egypt, only to close down the office when reforms did not materialize.66 Saudi Arabia is currently withholding vital petroleum shipments as it seeks to assert its leverage with Cairo and balance its own books.67 While Gulf patrons are testing the limits, the sense that Egypt is too big to fail may well prevent them from cutting Cairo off permanently. In Yemen, Cairo rebuffed Riyadh’s entreaties to join its military campaign. Eventually, Egypt sent ships to help enforce a naval blockade and formally signed onto the coalition, but its troops have not been deployed inside Yemen.71 As President Sisi put it, Egypt doesn’t want to “take part in devastating other nations, the ‘foolishness’ [in the Levant], only in building, reconstructing, helping countries enjoy welfare, security, stability. [I] never want to be a partner in destruction, only development; only reform, never a tool of destruction.”72 An Egypt whose actions match this aspirational rhetoric would be an asset to a region in chaos. Against this backdrop of immense need, significant disagreements, and unmet promise, the incoming U.S. administration presents Egypt with an opportunity to restore a strategic partnership with the United States. But it will not be easy. To channel newfound goodwill into tangible results that benefit both nations, there are a number of priorities the Trump administration should focus on. Trump has spoken often of the need to ask more from U.S. partners, especially aid recipients. In publicly affirming Sisi’s Egypt, Trump has already granted Cairo’s top “ask” before getting anything tangible in return. The incoming administration should now approach Egypt with its own requests, including a speech by President Sisi to the Egyptian public making clear that the United States is a partner—not a threat—to Egypt, steps to repair U.S. economic and military cooperation, significant progress in opening space for civil society, and the resolution of outstanding cases against members of civil society, especially the cases of secular activists such as Aya Hegazy, where the government cannot offer its fight against Islamists as an excuse.75 A lack of clear expectations at the outset risks disillusionment and even deeper dysfunction. The prospect of a White House visit should be an incentive for progress rather than an inducement to begin the conversation. A Trump administration risks walking away from longstanding bipartisan American commitments to rights and reforms in Egypt. That may win favor with Cairo’s government, but it would be a serious mistake for America’s long-term interests and values. Egypt’s repression represents a strategic liability to the United States—as well as a moral challenge—because it undermines long-term efforts to defeat violent extremists in the battle of ideas and lessens Egypt’s chances for success. These issues bear directly on Egypt’s stability and enduring value as a U.S. partner. Civic space is essential to enlisting citizens in Egypt’s renewal, which otherwise will rest on a worryingly brittle and narrow base of support. Simply outsourcing these concerns to Egypt’s rulers is unlikely to yield an answer satisfactory to enduring U.S. values or interests. The U.S. government, including military and intelligence officials, should speak in one voice in making clear that Egypt’s repression damages its prospects. Should President Trump and his team decline to do so, Congress should step in to fill the void. President Trump should make clear to Egyptians, as he should worldwide, that America is not at war with Islam and recognizes that the overwhelming majority of Muslims worldwide do not threaten America. His words and policies send a different message and have already harmed America’s standing and will continue to do so unless his tone changes. As a matter of principle and self-interest, the United States should raise concerns publicly about repression and seek to intervene privately as well. But this does not preclude recognizing successful reforms, affirming the U.S.-Egypt partnership, or connecting directly with Egypt’s people. As part of restored relations, the U.S. embassy in Cairo should renew its efforts to debunk conspiracy theories and raise awareness about the realities of U.S. support for Egypt. If Egypt’s government wants a healthy relationship with the United States, it should be required to take affirmative steps to lessen suspicions of America. Anti-Americanism directly stoked by Egypt’s media and other public figures is not only toxic for the relationship between the two countries but it also puts American lives at risk and disrespects the commitment the United States has shown Egypt, spanning more than 30 years and including tens of billions of dollars in assistance. America should demand better from its longstanding partner. A greater focus on training is needed, both to rebuild trust and to ensure that Egypt has the capacity to fight terrorism. The two militaries rarely conduct extensive joint training, and Egypt has reportedly sought to minimize continued U.S. contact with Egyptian trainees.78 In renewing ties, the United States should seek to break this pattern. The Bright Star joint military exercises currently slated for 2017—the first since 2009—represent another opportunity to refocus security cooperation, including on training.79 The United States should also seek opportunities to cooperate on the Sinai, especially on training to counter roadside bombs and training on counterinsurgency doctrine. Egypt’s planned contributions of medics to the anti-ISIS coalition in Iraq point to possibilities for reciprocal exchanges. Different modalities could be explored, including a multilateral facility where Egypt trains alongside Arab partners such as Jordan and the UAE. Now-Secretary of Defense James Mattis said last April, “When a president comes out two years in a row to Al Azhar University, calling for a revolution and rhetoric in order to reduce the amount of negatives about the Muslim religion, I think it’s time for us to support him and take our own side on this.”80 The key question, still largely unanswered, is how Egypt can make good on this ambitious rhetoric to meaningfully advance a more tolerant version of Islam. Egypt has potential and specific advantages in this area relative to other actors in the region, including a deep scholarly tradition with potential to be more inclusive and less sectarian. But how it respects its own citizens’ rights and beliefs is a fundamental test. In Egypt, the authors spoke with religious authorities from Al-Azhar and government officials about their efforts at countering violent extremism. These include training clerics, and an attempt to counter ISIS propaganda in real time by disseminating religious rulings on social media. But the country needs an integrated strategy with buy-in and participation from civil society, religious institutions, government ministries, and security agencies. More work is needed in both the mainland and the Sinai to reach youth on the path of radicalization and target at-risk communities with community-police partnerships and tailored programs aimed at expanding economic opportunity. If President Sisi hopes to fulfill his ambitious goals to win the ideological battle against extremism, efforts such as these will need to be multiplied many times over and coupled with contemporary marketing strategies to reach more people, faster, in simpler language. The United States could play a role in aiding this effort by exploring ways to develop joint strategic messaging programs or coordinating with existing ones such as the UAE-based Sawab Center. U.S. technology companies can also develop a relationship with relevant personnel at institutions such as Al-Azhar and Dar al-Ifta to help make their platforms accessible to Egypt’s counter-extremism efforts. The United States has an interest in seeing extreme ideas, including those held by many Islamists, challenged and defeated in the Middle East and worldwide—as well as an interest in helping foreign partners combat terrorism. However, using the mechanisms of American counterterrorism to fight an ideological battle against Islamists invites dangerous overreach at home and greenlights counterproductive repression abroad. Such an approach is self-defeating: Trump’s words and others’ that conflate Islam itself with Islamism, extremism, and terrorism risk framing the battle of ideas within Islam as a civilizational struggle between Islam and the West that validates the narratives of extremists such as IS. That is why even the most professional U.S. intelligence review and dialogue cannot solve U.S. concerns over Cairo’s counterterrorism strategy because what concerns many U.S. officials is not who constitutes an extremist but rather the most effective, sustainable way Egypt’s government can fight terrorism. Here, too, America’s stake in a sounder approach extends beyond moral advocacy: Should Egypt fail to counter terrorism or act counterproductively, that could harm American and global security. The incoming U.S. team’s rhetoric—including former National Security Advisor Gen. Michael Flynn’s repeated conflation of Islam with violent Islamic extremism, evidenced by comments such as “Islam is a political ideology” that “hides behind the notion of it being a religion”—have raised fears of an anti-Muslim “witch hunt” against American Muslims without links to terrorism, as these voices so often fail to even distinguish between all Muslims and Islamist extremists.81 U.S. policy regarding nonviolent Islamists in America has been to prosecute those who may have financed terrorist organizations and not to designate the American groups that these individuals belong to as terrorist organizations themselves unless they engage in terrorism or provide material support to terrorists. That approach must continue. The U.S. administration, law enforcement, and Congress must draw a red line separating the Sisi government’s fight against the Egyptian MB from the impulses of some in both countries who wish to extend this fight to the United States and potentially violate the constitutionally protected rights of law-abiding American Muslims. There are many areas where Egypt could benefit from U.S. public and private expertise, from integrating into global supply chains to governing a growing natural gas sector. However, the recent experiences of U.S. and Gulf donors make clear that such efforts risk running aground absent sustained top-level Egyptian support—and even then they face an uphill climb. In such efforts humility is warranted. A clear signal to Egypt’s bureaucracy is required from the highest levels to not obstruct U.S. advisors. Where Egyptian cooperation is lacking, the United States should continue to reprogram its aid elsewhere. Both sides also can do more to enlist businesses as partners. Both governments should consult with their business communities to present proposed quick wins: viable recommendations to build momentum for better economic ties. Alongside a hard push for reform, the incoming team could build on programs such as the Egyptian-American Enterprise Fund that encourage Egyptian entrepreneurship. The United States should resist pressure to steer U.S. assistance away from direct engagement with Egyptian people toward less sensitive issues such as infrastructure, sewage, or direct financial aid. Areas to explore include military and police exchanges, as well as student exchanges, but also the untapped soft power of culture and heritage. Because U.S. economic assistance is dwarfed by Gulf aid and IMF loans, U.S. cash transfers and loan guarantees have little diplomatic or economic merit and should be avoided. Egypt is a fiercely independent nation with important ties to the Gulf states, Israel, Russia, and others. Its pride and its problems alike mean that any country seeking to monopolize or dictate to Egypt will fail. The United States should welcome other nations’ economic support for Egypt and even—with important exceptions—some military support as well. Interoperability with the U.S. military is valuable, but nearly half of Egypt’s equipment today is not made in the United States.82 Targeting U.S. assistance on the four pillars plus training may mean that Egypt chooses to purchase other items elsewhere. President Trump, in his meetings and statements to date, has set the stage for a significantly closer bilateral relationship with President Sisi and Egypt. However, this policy will prove shortsighted unless matched with a demand that Egypt unblock bilateral cooperation and chart a path toward firmer political and economic ground. U.S. policy must prepare for the real possibility that Egypt chooses a different path—one where the state smothers the public sphere, preempts any battle of ideas, stifles the economy, and stiff-arms well-intentioned partners such as the United States. If this comes to pass, then America’s investment in Egypt’s future risks being squandered on the creation of a brittle order that once again stifles the immense potential of the Egyptian people. Daniel Benaim is a Senior Fellow at the Center for American Progress, researching U.S. policy in the Middle East, as well as a visiting assistant professor at New York University. Previously, he served as a Middle East policy advisor and foreign policy speechwriter at the White House, the State Department, and the U.S. Senate. He was also an international affairs fellow at the Council on Foreign Relations. Until June 2015, he was foreign policy speechwriter and Middle East advisor to Vice President Joe Biden, traveling with the vice president to 25 countries. Before that, he wrote speeches for Secretary of State Hillary Clinton and Deputy Secretaries Bill Burns and Tom Nides and served as a member of Secretary Clinton’s policy planning staff covering Egypt. Benaim also has been a professional staff member on the Senate Foreign Relations Committee, chief speechwriter to Sen. John Kerry (D-MA), and a detailee to the National Security Council staff. Benaim’s writings have appeared in The New York Times, the International Herald Tribune, The Wall Street Journal, The New Republic, The National Interest, and The Boston Globe. He received his master’s degree in law and diplomacy from The Fletcher School and his bachelor’s in English literature from Yale University. Mokhtar Awad is a research fellow in the Program on Extremism at The George Washington University. He specializes in Islamist and Salafist groups in the Middle East region and regional politics, with a special focus on emerging violent extremist organizations and their ideas. Prior to joining the Program on Extremism, Awad worked as a Research Associate at the Center and as a junior fellow in the Middle East Program at the Carnegie Endowment for International Peace. Awad’s writings have appeared in The Washington Post, Foreign Policy, Foreign Affairs, CTC Sentinel, Atlantic Council, and Hudson’s Current Trends in Islamist Ideology. Awad has testified before the U.S. Congress and U.K. Parliament. Awad regularly provides commentary to news networks including Al-Hurra, Al-Arabiya, and Al-Jazeera. Print media quotations have appeared in The New York Times, The Wall Street Journal, The Times, among others. Brian Katulis is a Senior Fellow at the Center, where his work focuses on U.S. national security strategy and counterterrorism policy. For more than a decade, he has advised senior U.S. policymakers on foreign policy and has provided expert testimony several times to key congressional committees, including the U.S. Senate Committee on Foreign Relations and the U.S. Senate Armed Services Committee. Katulis has conducted extensive research on the ground in the Middle East, where he has lived and worked in a number of countries, including Egypt, the Palestinian territories, Israel, and Jordan. His past experience includes work at the National Security Council and the U.S. Departments of State and Defense during President Bill Clinton’s administration. He also worked for Greenberg Quinlan Rosner Research, the National Democratic Institute for International Affairs, Freedom House, and former Pennsylvania Gov. Robert Casey (D). Katulis received a master’s degree from Princeton University’s Woodrow Wilson School for Public and International Affairs and a bachelor’s degree in history and Arab and Islamic Studies from Villanova University. In 1994 and 1995, he was a Fulbright scholar in Jordan. Katulis regularly provides commentary on leading television and radio programs, including “PBS NewsHour” and National Public Radio. He has also published articles in several leading newspapers, including The New York Times, The Washington Post, and The Wall Street Journal. He is co-author, with Nancy Soderberg, of The Prosperity Agenda, a book on U.S. national security published by John Wiley & Sons in 2008. The authors would like to thank the many American and Egyptian colleagues who insights helped shape this report, including Jon Alterman, Muath Alwari, Alia Awadallah, Perry Cammack, John Desrocher, Andrew Exum, Hisham Fahmy, Michael Hanna, Amy Hawthorne, Peter Hessler, Peter Juul, Ella Lipin, Kate Martin, Andrew Miller, Roopa Rangaswamy, Matt Spence, Dana Stroul, Samuel Tadros, Eric Trager, and Michael Werz.